Situated in the dense forest of south-east Siberia, the massive goldfields that lined the river Lena were, at the turn of the century, amongst the most profitable enterprises in the Russian Empire. The Lena Gold Mining Joint Stock Company (Lenzoloto), the principal owner of the majority of goldfields in the region, was running at profits of 7,000,000 roubles a year. The comfortable lifestyle that these profits afforded the company's principal shareholders, mainly British industrialists and members of the Russian aristocracy, contrasted sharply with the harsh way of life that the miners of Lena and their families had to endure. Often working 16 hour days in appalling conditions, accidents among miners were common, with 700 traumatic accidents reported for every thousand workers. Low pay barely kept families above the bread line, and large amounts of money were often deducted as fines if a miner was perceived to be doing 'poor work'. A large proportion of a miners pay was also in food coupons to be used at company stores, where the food sold, especially meat, was often inedible. Discontent in the goldfields was high, and a strike broke out spontaneously on February 29 with hundreds of workers walking out at the Andreyevsky field after being issued rancid meat at the company store, reportedly made from horse penises. Joined by some 6000 workers from other fields by mid-March, the strike in the region was total and production at the Lenzoloto had ground to a halt. A strike committee was set up, and demands were established; a 30% wage increase, elimination of fines, the 8-hour day, and an improvement of food issued at the stores. Initially disposed to negotiate with the miners, talks eventually broke down on March 22. Possibly under pressure from the government, the Lenzoloto directors resolved to end the strike quickly and troops were sent from the town of Kirensk, some 200 miles away. The arrival of the troops saw the swift arrest of the entire strike committee in the early hours of April 17 in Bodaybo. A march was organised the same day, and by mid afternoon about 2500 workers were marching to the local prosecutor's office to demand their immediate release. Met by a thick line of soldiers under the command of a gendarmerie officer, Captain Treshchenkov, near the Naderzhdinsky field, the unarmed marchers were fired upon. 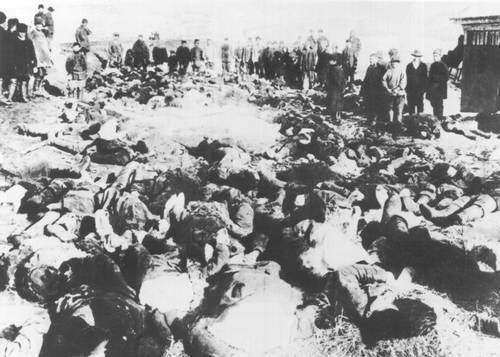 When the shooting had ended, over 500 men lay dead or wounded, with at least 250 believed to have been killed. "We were so dazed and shocked that we could not at once find words to express our feelings. Whatever protest we made would be but a pale reflection of the anger that seethed in the hearts of all of us. Nothing can help us, neither tears nor protests, but an organized mass struggle"
Involving some 300,000 workers, these strikers later combined to form the mass strike movement that engulfed the cities of Russia on May Day of 1912, which, among other things, demanded a universal 8-hour day for all workers. This movement saw over 1000 strikes occur in Petrograd alone. Militancy among Russian workers had been steadily decreasing since the 1905 revolution, reaching a low point in 1910 with only 222 strikes occurring nationally compared to nearly 14,000 five years previously. The tragedy at the Lena goldfields acted as a factor in the reversal of this trend. The anger generated by the shootings again forced mass discontent to envelop the country and the number of strikes increased nearly four-fold during 1912 to 1,918, compared to just 466 the previous year. The strikers at Lena held out until August 12, when the last of the workers eventually capitulated and left the goldfields for good. By the end of August, around 9000 workers and their families had abandoned the area.